This was one of the celebration dishes I made on the day of Mid-Autumn festival. Oh, goodness me, it's been a while until I finally post the recipe. I guess it’d be better to post some time after the festival as this dish is very versatile throughout the year and you can whip it up in 15 minutes. If you or your family is a fan of chicken wings, you have to give it a go. It’s also a life-saver on a hectic day. 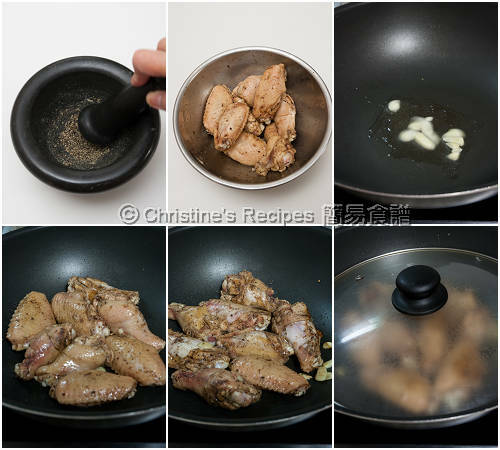 You can refrigerate the marinated chicken wings well ahead, then pan fry them whenever you’re ready. The key to making this dish successful and delicious is not to over cook the chicken wings. When they are just done, the chicken meat is succulent and juicy. Blanch chicken wings in boiling water to remove blood and any impurities for about 3 minutes. Drain well. Mix with seasonings. Set aside for about 30 minutes. Heat oil in a wok or frying pan. Saute garlic over medium high heat. Make sure not to burn them. Add the chicken wings. Cook until both sides are lightly brown. Pour in the remaining seasonings. Cover and cook for about 4 to 5 minute, or until the wings are cooked through. Serve hot. I used a pestle and mortar to ground some black peppercorns. They are so fragrant when freshly grounded. They won’t be too hot anyway. Or you can get the store-bought coarsely black pepper, available at supermarkets. 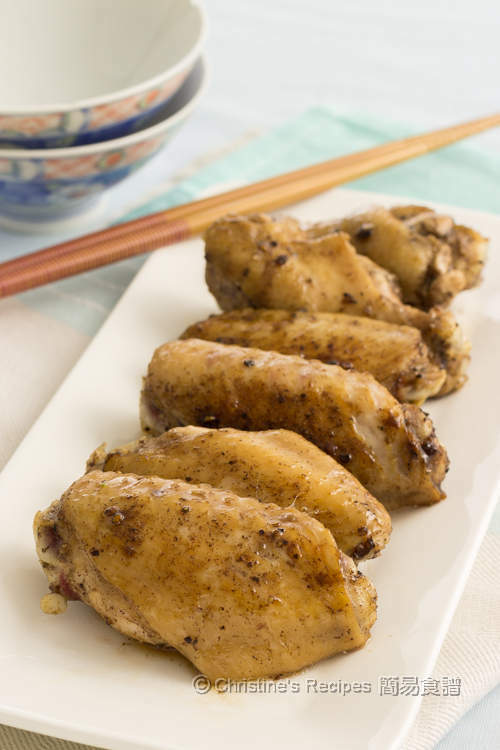 Don’t use black pepper powder for making this dish as you don't want the chicken wings turn black in colour and taste differently. They look so tender and delicious! 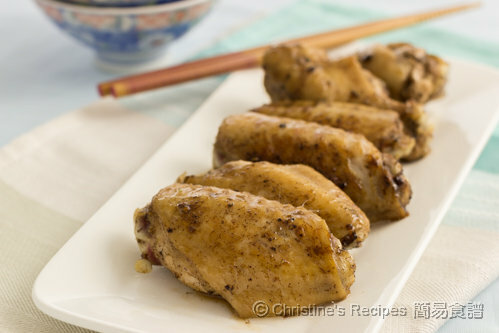 Hi Christine, is it ok to use chicken thighs instead of wings? Do I cook the thighs longer? Thanks! Sure, chicken thighs or drumsticks are good choices. It needs longer cooking time as the the meat is thicker. But be sure not to over cook them. Thanks for responding so fast! Do I have to increase the marinade as I will cooking the chicken thighs whole? If you use chicken thigh, increase the quantity of marinade proportionally and also cook for a bit of longer time. Hi Christine, this is a delicious recipe - what five spice brand do you use? I bought a packet from a nearby Asian grocer. Don't remember its brand. It doesn't matter which brand you use. Hi Christine, just wondering if the wings could be baked using this recipe. Thanks. I think so, even though I haven't tried.